As one of the world’s leading car manufacturers, we take seriously our responsibility to help protect the environment. That means creating vehicles which have as little impact as possible on the natural world around us. It is not just a matter how they perform when they are driven on the road; we believe it is just as important to find cleaner, sustainable ways of making vehicles and disposing of them when they reach the end of their useful life. We have spent decades researching how we can make vehicles that are kinder to the environment, producing technologies such as hybrid that have already proved their value in reducing greenhouse gas emissions and helping us move towards a low carbon society. We are still on that journey and we want to reduce our vehicle CO2 emissions by 90% by 2050, compared to the level we were at in 2010. We will reach that ambition by accelerating the popularization of electrified cars, aiming to put more than 5.5 million on the road every year, by 2030 - at least one million of which will be zero-emissions vehicles. It is not just about reducing CO2, however, we share the concerns of governments and consumers around the world about the importance of air quality and continue to invest in finding ways of reducing vehicle emissions that directly impact on people’s health, such as nitrogen oxides (NOx) and particulates (PM) within our 360-degree view of design and technology innovation. We have announced ambitious plans to reduce CO2 emssions from vehicles in operation (tank-to-wheel) by 90% by 2050. Around the world, people use different types of vehicles to suit their lifestyle and their local environment. Some may only need a small car for short urban journeys, while others require a larger and more powerful vehicle to make regular long-distance trips. Concern about the environment and cutting carbon emissions cuts across these differences, which is why we believe there is no single solution when it comes to creating the ultimate eco-car. With our hybrid system we have produced a low carbon technology that can be used in multiple ways to address these different demands. Ever since vehicles began using the internal combustion engine in the late 19th century, they have largely relied on fossil fuels that produce CO2 and contribute to global warming. While conventional engines will continue to play an important role in the short to medium term, we are researching and developing alternatives such as biofuels from organic sources, electricity and, more recently, hydrogen. With this multi-path approach we aim to secure better environmental performance by providing the right car, in the right place, at the right time. "Natural resources are limited. We must be friendly to the planet. We have to hand it to our future children." Our route to producing the ultimate eco-car takes in different applications of our hybrid technology and the use of alternative fuels to secure the best results across a complete range of driving requirements. With the launch of the Mirai, the world’s first mass-produced hydrogen fuel cell electric sedan, our range of advanced, alternative power vehicles continues to grow, taking our technology out of the research laboratory and on to the road. In addition, we have also developed battery electric vehicles, such as the prototype i-ROAD and COMS, designed for urban mobility and the subject of real-world testing for integrated transport systems in different cities around the world. By the early 2020s, we plan to make more than 10 battery electric models available in world markets. These zero-emissions vehicles create a technical roadmap for our journey towards the ultimate eco-car – one which aims to have no harmful impact on the environment. Battery Electric This colourful, electric-powered three-wheeler was used by citizens in Grenoble, France as part of a connected urban transport real-world test. Fuel Cell Electric The Mirai, introduced in Europe in 2015, is the world’s first mass production fuel cell sedan, powered by electricity produced from hydrogen fuel. Our range includes an ever-increasing number of hybrid electric vehicles and a rechargeable plug-in hybrid electric. We are continuing to make our petrol-electric hybrid technology even more efficient and compact, introducing the Toyota Hybrid System II in the current Prius and other models. We are also making a more powerful version available and are engineering a simpler hybrid system for some of our cars. Hybrid Electric The Prius was the first of our hybrid electric models to go on sale, from 1997. Since then the number of available vehicles has steadily increased and today there are 34 different models sold around the world. Plug-in Hybrid Electric The Prius Plug-in marks a “next-step” in hybrid efficiency. First launched in 2012 after a three-year real-world research programme in Strasbourg and other locations worldwide, it benefited from a comprehensive technology upgrade in a second generation model introduced in 2017. 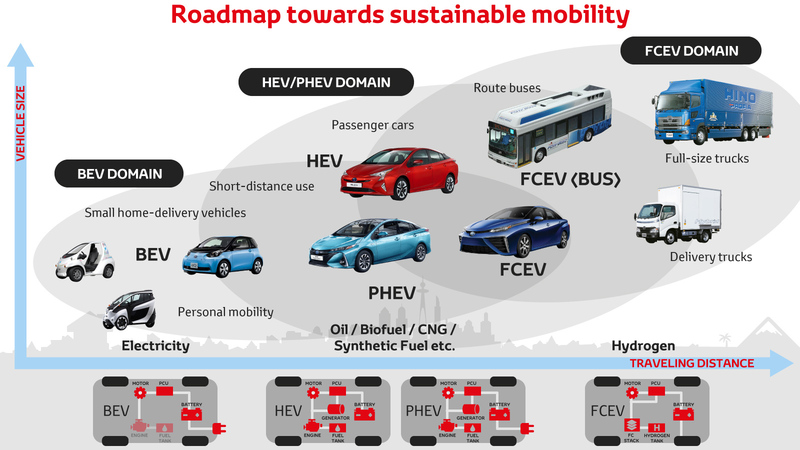 Our technology roadmap brings together a broad range of environmental technologies for cleaner, more efficient future mobility, including hybrid electric, plug-in hybrid electric, battery electric power and fuel cell electric systems. Each technology moves us closer to our goal of creating the ultimate eco-car. By 2050 our aim is to reduce our vehicle CO2 emissions by 90% compared to the level in 2010. Our strategy to reach this goal is to accelerate the development and the popularization of electrified vehicles – hybrid electric, plug-in hybrid electric, fuel cell electric and battery electric vehicles. By around 2025, every model in our Toyota and Lexus ranges will either be a dedicated electrified vehicle, or will be available with an electrified powertrain as an option. This will help us ensure widespread take-up of cleaner cars by motorists, to the point where we aim to be putting 5.5 million electrified vehicles on the world’s roads every year by 2030. This total will include at least one million vehicles with zero emissions. Our innovative hybrid power technology is applied to a range of vehicle types to suit the personal preferences and the mobility needs of many different customers, including battery electric, hybrid electric, plug-in hybrid electric and fuel cell electric vehicles. To achieve our goals, we can call on our industry-leading experience of having already sold more than 12 million electrified vehicles worldwide since we introduced hybrid electric technology to the car market with the original Toyota Prius in 1997. With constant improvement of our hybrid know-how and by monitoring the way people choose and use their cars, we are able to deliver technical innovation in ever-better vehicles that combine more environmentally friendly performance with strong customer appeal. Our multi-award-winning Hybrid Synergy Drive hybrid power system is the core technology shared by all the different powertrains in our roadmap. The fact it is modular in design means that it can easily be adapted for use in different types of vehicle. In plug-in hybrid electric vehicles it is largely unchanged, but uses a more powerful battery that can be recharged from an external power supply. In battery electric vehicles its format is simpler with no petrol engine and a more powerful electric motor. 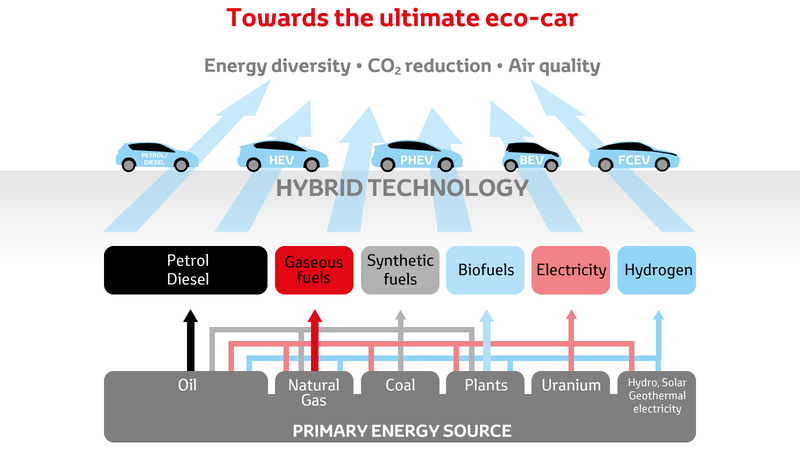 In fuel cell electric hybrids the petrol engine is replaced by the fuel cell stack, to generate electricity from hydrogen fuel with no harmful tailpipe emissions. Biofuels We are researching how organic material, even waste products, can be used as a viable source of vehicle fuels. Conventional Engines At the same as we are introducing alternative powertrains, we are still committed to making our conventional engines even cleaner. Eco-driving Simple changes to your driving habits can make a positive difference to your car’s fuel consumption and emissions – and save you money, too. Cite' Lib by Ha:Mo An innovative new mobility project was launched today in Grenoble (France) that could pave the way for cleaner, less congested cities of tomorrow. Long-distance driving with Toyota Mirai - a hydrogen fuel cell car Europe’s network of hydrogen fuelling stations is continually expanding. In practice though, is it really possible to drive a hydrogen fuel cell car from northern Europe to southern Europe? Jacob Krogsgaard, CEO of H2 Logic, put it to the test with his Toyota Mirai. What is Hybrid? Discover how our Hybrids have been designed to make your life easier. Simple Truths Discover the simple truths behind eight common Hybrid misconceptions. FAQs Here you can find some popular frequently asked questions and answers to help you with your decision to switch to hybrid. Toyota Hybrid Discover more about Toyota Hybrid and see why over eight million people have chosen a better way to drive. Benefits of Hybrid Whether you’re looking to rediscover your love of driving, reduce the cost of getting around or just have some fun without the emissions – there’s a long list of ways our Hybrids can make a good impression. Fuel Cell Technology Fuel cell vehicles (FCV’s) are powered by fuel cell stacks, which generate electricity from a reaction between hydrogen and oxygen from the air.